Help shape a strategy to support and grow the creative and cultural industries sector and the Yukon economy. The creative and cultural industries are a distinct and important part of Yukon’s culture, providing economic as well as social benefits to the territory. A working definition of creative and cultural industries is helpful in understanding the scope for this project. Learn more about the importance of culture to the Canadian economy. Video includes the latest figures for culture Gross Domestic Product (GDP) and jobs. Working together the departments of Tourism and Culture, Economic Development, and Education are preparing an action-focused strategy targeted specifically on the growth and development of Yukon’s creative and cultural industries. With the guidance of the Women’s Directorate, the strategy also aims to give attention to elements that support and advance diversity and inclusivity to contribute to improved socio-economic outcomes. The cultural industries are a direct contributor to Yukon’s economy and are poised for growth. According to Statistics Canada, Yukon's culture GDP was $56.3 million in 2016, a 1.4% increase from the previous year, and amounted to 2.1% of the total territorial economy. 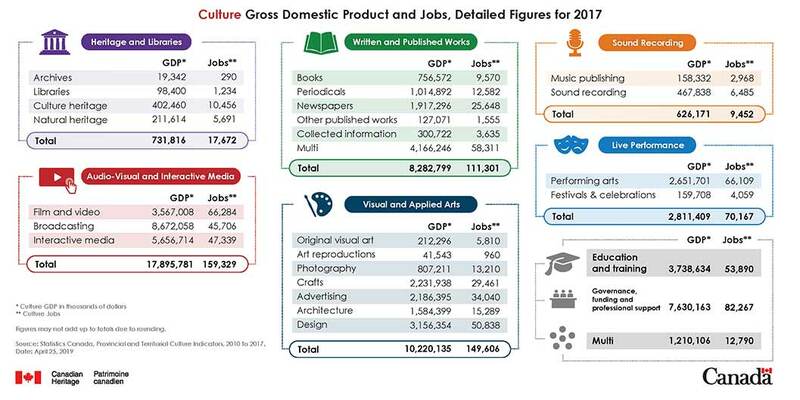 For comparison, Canada’s culture GDP totalled $53.8 billion in 2016, a 1.5% increase from the previous year, and accounted for 2.8% of Canada’s total economy. Culture’s contribution of 2.1% in Yukon’s economy compared to 2.8% in Canada’s shows there is significant potential for Yukon in this sector. A prosperous creative and cultural industries sector would not only strengthen our creative community, but also contribute to the development of other sectors such as tourism, small business, manufacturing and education. To ensure the strategy will be effective and relevant for those it is meant to support, we are engaging with individuals who work in the creative and cultural industries on a number of occasions. This will help identify what supports are needed and guide where to focus the action plans. We are also incorporating research on best practices from across the country and ensuring the strategy actions consider and include elements to support diversity and inclusivity of all Yukoners. A consultant is performing research and gathering statistics to form our baseline data. This information will provide an overview of the current state and demographic composition of the creative and cultural industries in Yukon, as well as the rest of Canada. It will also provide insight into what our counterparts across the country have developed to support and grow the creative and cultural industries. A day-long public engagement session is planned to bring together the sector to examine the existing supports available and to solicit input and feedback on the engagement process, priorities, challenges and opportunities to ultimately determine goals and outcomes for the strategy. What we learn and hear at the session in May will inform how we plan the next phases of this process. A series of smaller, more focused conversations on action plan topics are anticipated to take place over the summer in Whitehorse, as well as other communities. Online or paper submission options will also be made available to those who cannot attend the meetings or prefer to participate in this manner. More details will be shared as they are determined and as we learn from the sector. The draft strategy will be shared this fall for feedback and comments before it is finalized.